Located in Historic Alexandria, Virginia, our one-of-a-kind establishment is more than just a restaurant — it’s a supper club and full-scale entertainment experience. Just ten minutes from Washington, D.C., the Carlyle Club is conveniently located within walking distance to four hotels and the King Street Metro station. The Club is the premier venue for everything from weddings, live entertainment, private and corporate events and much, much more! • No membership is required and we are open to the public during scheduled show times. 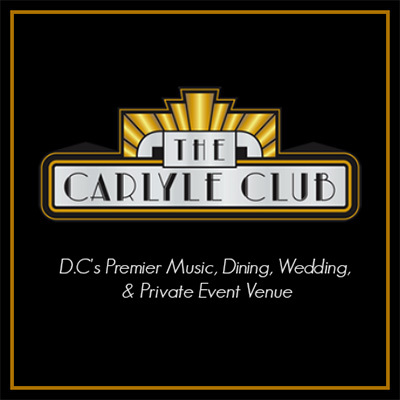 • The Carlyle Club is available for private events on all other dates. • All ticket sales are final. No refunds or exchanges. • Please contact us with any questions or to buy tickets. Food & Beverage Minimum: There is a $25 minimum food and beverage purchase required per guest in the dining room. This applies to all tickets except General Admission. • Street parking is available or you may park in the garage beneath the Carlyle Club. •From Elizabeth Lane take the access road behind Catholic Charities building to garage entrance. • Take the elevator to the first floor. • Venue entrance is located on the corner.